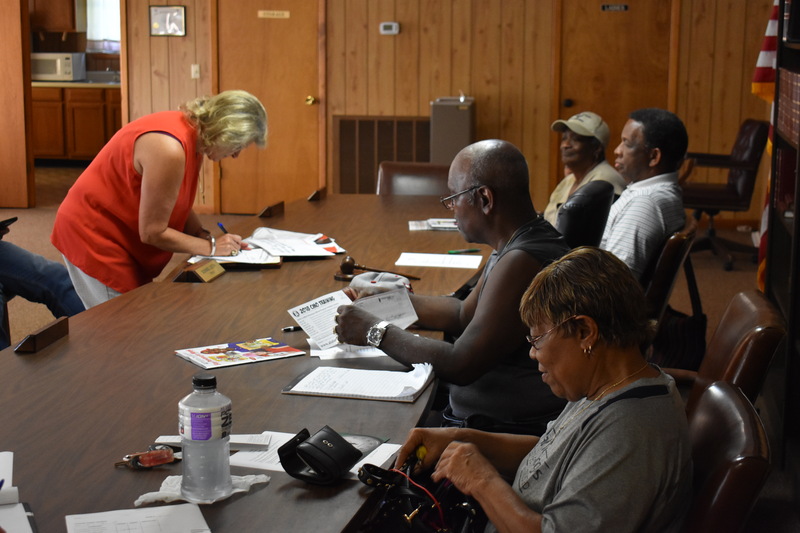 COLONY – On Tuesday evening, the Colony Town Council, with help from County Economic Development Director Cherrie Haney, reviewed two bids for its proposed community storm shelter, awarding the contract to Harbor Enterprises, DBA Survive-A-Storm Shelters, of Thomasville, Georgia. The winning bid was in the amount of $82,000 including the shelter, two restrooms with water lines, and a generator. Aqua Marine Enterprises of Danville, manufacturer of Safe-T-Shelter safe rooms, submitted a bid of $82,505. The bid appeared to list restrooms and the generator only as additional options. Colony received a grant to cover 75 percent of the project’s cost, leaving the Town responsible for $20,500. Clerk Patricia Ponder reported that the Town’s project budget was $27,000, placing the accepted bid well below the budgeted amount. The council also reported the reception of a nearly $10,000 grant from Morehouse School of Medicine under the college’s Healthy Communities Initiative. According to the grant application, Colony will have $9,898.02 to expand its Educational Complex raised garden beds into a complete community garden with six additional beds, tools, seeds and fertilizer, and two part-time staffers to oversee the garden during the growing season. Representatives from Carpenter’s Cabinet came to the meeting to drop off paperwork to help get the town’s food pantry set up. The organization is an established ministry with pantries in Falkville and Holly Pond in partnership with the North Alabama Food Bank. Once set up, Colony will be able to purchase food in bulk from the North Alabama Food Bank for only 14 cents per pound; donations to the town’s pantry will be tax deductible. Council parks and recreation committee chairman Curtis Johnson told The Tribune that attendance has dropped off at the town’s summer feeding program, and that the program could possibly end before its scheduled conclusion on the last Friday of July. The Colony Town Council meets at 6 p.m. on the second and fourth Tuesdays of each month at Colony Town Hall. The public is invited to attend.